I know it’s taken more than a year to get these all together, but thanks to Uldis Bojars we’ve been able to salvage about half of the Dork Shorts, or two minute talks, that were given at the LODLAM Summit in 2011. The video is a little bit shaky and even pulling them together was an afterthought. But it captures the excitement of this meeting and the various experts that were coming together. Also, thanks to David Weinberger, we’ve got some great interviews with a couple of participants. I’ve added all of the videos into a Youtube Channel for your reference. 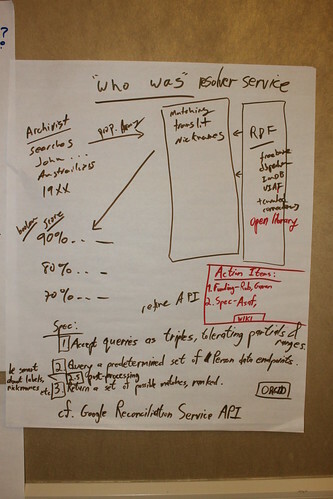 Thanks to Kris Carpenter Negulescu and the team at the Internet Archive, as well as Asa Letourneau, we’re adding an archive of session notes recorded on easel pads during the SF Summit. The images are available through the Public Record Office Victoria Flickr set, and you can also download a Word Doc or .rtf version of the transcriptions. The latter are numbered, though I don’t think we’ve mapped the images to the numbered transcriptions, which may be helpful. There’s quite a few photos from the event in the slides, as well as some from the Internet Archive visit on the last slide. I drew attention to the breakout group notes on the Pirate Pad as the place to go to find out more, as well as the Summit blog of course. There was clearly interest in the #lodlam London event (#lodlamlon ?) that Mia Ridge and myself have been talking about. Mia has taken the lead on pulling this together via the meet-up page. I also noted that Antoine Isaac was suggesting the possibility that the #lodlam community may be able to pick up the W3C Library Linked Data Incubator Group activities that are about to finish soon. There’s a write up of my report and the other talks from the event on Owen Stephen’s ‘Overdue Ideas‘ blog. First of several videos from David Weinberger capturing some of the proceedings from the Summit. Thanks David, and all the interviewees! One of the outcomes of last week’s LOD-LAM Summit was a draft document proposing a new way to assess the openness/usefulness of linked data for the LAM community. This is a work in progress, but is already provoking interesting debate on our options as we try to create a shared strategy. Here’s what the document looks like today, and we welcome your comments, questions and feedback as we work towards version 1.0. Publishing openly licensed data on the Web and contributing to the Linked Open Data ecosystem can have a number of benefits for libraries, archives and museums. Stimulating collaboration in the library, archives and museums world and beyond. In order to achieve these benefits libraries, museums and archives are faced with decisions about releasing their metadata under various open terms. To be open and useful as linked data requires deliberate design choices and systems must be built from the beginning with openness and utility in mind. To be useful for third parties, all metadata made available online must be published under a clear rights statement. This 4-star classification system arranges those rights statements (e.g. licenses or waivers) that comply with the relevant conditions (2-11) of the open knowledge definition (version 1.1) by order of openness and usefulness: the more stars the more open and easier the metadata is to used in a linked data context. 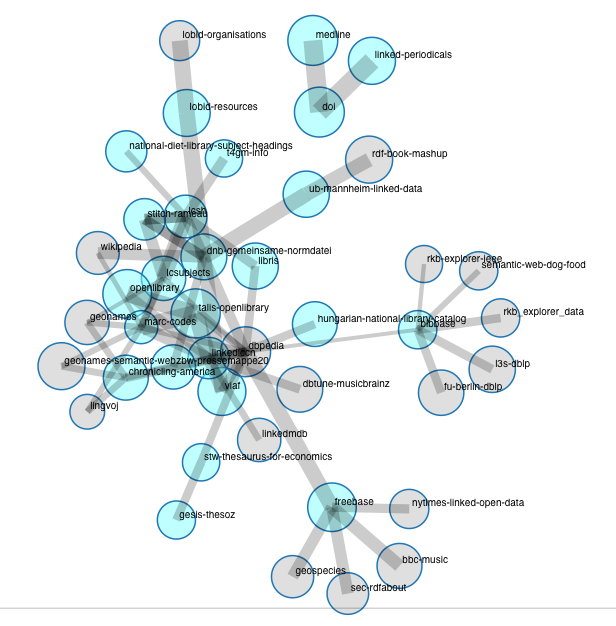 Libraries, archives and museums wanting to contribute to the Linked Open Data ecosystem should strive to make their metadata available under the most open instrument that they are comfortable with that maximizes the data’s usefulness to the community.. Note: This system assumes that libraries, archives and museums have the required rights over the metadata to make it available under the waivers and licenses listed below. If the metadata you want to make available includes external data (for example vocabularies) you may be constrained by contract or copyright to release the data under one of the licenses below. This option is considered best since it requires the least action by the user to reuse the data, and to link or integrate the data with other data. It supports the creation of new services by both non-commercial and commercial parties (e.g. search engines), encourages innovation, and maximizes the value of the library, archive or museum’s investment in creating the metadata. This option meets the definition of openness, but constrains the user of the data by requiring them to provide attribution (in the legal sense, which is not the same as citation in the scholarly sense). Here, attribution is satisfied by a simple, standard Web mechanism from the new data product or service. By using standard practice such as a linkback, attribution is satisfied without requiring the user to discover which attribution method is required and how to implement it for each dataset reused. Note that there are other methods of satisfying a legal attribution requirement (see below) but here we propose a specific mechanism that would minimize the effort needed to use the data if the LAM community collectively agrees to it. Also note that even this simple (ideally shared) attribution method could prevent some applications of linked data if linkbacks are required by many datasets from many sources. This option meets the definition of openness in the same way as the linkback attribution open, but requires the user to provide attribution is some way other than a linkback, as specified by the data provider. The provider could specify an equally simple mechanism (e.g. by retention of another field, such as ‘creator’ from the original metadata record) or by a more complex mechanism (e.g. a scholarly citation in a Web page connected to the new data product or service). The disadvantage of this option is that the user must discover what mechanism is wanted by the particular data provider and how to comply with it, potentially needing a different mechanism for each dataset reused. For large-scale open data integration (e.g. mashups) this option is difficult to implement. This option meets the definition of openness but potentially limits reuse of data since if more than one dataset is reused and if each dataset has an associated Share-Alike license. Under an Share-Alike license, the only way to legally combine two datasets is if they share exactly the same SA license, since most SA licenses require that reused data be redistributed under exactly same license. If the source datasets had different Share-Alike licenses originally (e.g. CC-BY-SA and ODC-ODbl) then there is no way for the user to comply with the requirements of both source data licenses so this option only allows users to link or integrate data distributed under one particular SA license (or one SA license and any of the other license or waiver options above). In the LAM domain, where significant value is created by combining datasets, the Share-Alike license requirement severely reduces the utility of a dataset. We plan to keep updating and use this in one of our incubator’s deliverables (draft in progress here, comments welcome as for the main LLD report draft). The idea is to get something closer to our community than the ever growing general LOD cloud. So, we’ve got a start for the “L” in LAM. But where are As and Ms? C’mon!!! Thanks to everyone who participated in the Beyond OAI-PMH session this morning. There seems to be a number of places where others have posted their session summaries, but I thought it would be useful to include that here on the LOD-LAM site as well. This is my brief (and somewhat tardy) account of our meeting based on the notes that I jotted down. Comments and responses are welcome and any misrepresentations are my own. 1. We need to leverage existing OAI-PMH installation base for Linked Data, because after all it does fit within the basic requirements (three stars) of Linked Data goals. We should acknowledge current OAI-PMH for their existing contributions to Linked Open Data and emphasize that they already are participating in LOD through OAI-PMH. While there are some additional things we can do to make the metadata we share more LOD friendly, LOD is not a completely new idea. Additional documentation about how OAI-PMH has succeed and failed – and what lessons that holds for the future of LOD – would be welcome. It would be better for the community to look towards broadly adopted web standards. Repositories need to provide what users want in multiple serializations, not limited to XML (let alone a specific XML schema). Of course the devil is in the details, during the session we had several tangential conversations about the technical details of how to implement some of these alternatives that I haven’t fully captured here. To me this indicates that further discussion about these different options and how they might be shaped into a common framework is needed and would be valuable guidance for the community. Prior to the LOD-LAM summit, ELAG2011 took place in the impressive Czech National Technical Library in Prague from 24th to 27th of May under the slogan “It’s the context, stupid!”. ‘ELAG’ stands for “European Library Automation Group” which is an annually meeting of technicians from the European library world plus some international participants. This conference stands out from other gatherings of librarians: It is attended by a lot of technical staff or other practitioners. There is no formally elected ELAG planning group, anyone can join in and participate in the organization of ELAG. This grassroots approach combined with the attendees’ hands-on attitude guarentees most of the time really exciting workshops and presentations. Also, marketing language is frowned upon by the practitioners which attend ELAG (just take a look at the tweets to get an impression). Consequently, the sponsorship is only promoted decently and no products are presented along the way. The perfect basis for a great conference! Obviously ELAG 2011 was a good preparation for the LOD-LAM summit and I hope that the discussions that took place and the topics that were discussed at ELAG 2011 will be picked up at the summit. Linked Open Data played a central role during the whole ELAG conference. According to the program, there were at least eight of fifteen presentations, one of four pre-conference bootcamps and two of ten workshops which obviously had Linked (Open) Data as subject. With these words Anders Söderbäck in his presentation “Who controls bibliographic control?” tried to capture the spirit of ELAG2011 and to draw the attention of two big library system vendors to the topic of LOD. Preceding Anders’ post in the session on cloud computing, represantatives of OCLC and ExLibris had the opportunity to talk about their companies’ future cloud-based library management systems. While Paul Harvey from OCLC held the usual OCLC presentation about the company’s Webscale Management System (in development), Carl Grant didn’t talk too much about ExLibris corresponding product Alma (also in development) but about his general approach to cloud computing. How about web integration of library data in future systems? Being directly asked by Till Kinstler what both companies do to integrate their systems into the web, none of the vendor representatives managed to actually provide an answer. To me it looks like OCLC and Ex Libris started one or two years too early with buidling their new cloud-based systems and now – understandably – have problems to adjust to the looming fundamental changes to cataloging, data formats and data licensing in the library world. Some news during ELAG2011 made it seem that at least OCLC moves into the right direction. A blog post by John Mark Ockerbloom brought the good news on the licensing aspect, pointing to OCLC’s strategy change to investigate open licensing and allowing or even encouraging the publication of Open Data by member institutions. Hopefully, OCLC will further pursue this path. For me, the most significant insight at ELAG2011 was how important for single institutions as well as for the whole community a consequent approach in adopting LOD is. By now, most of the active institutions are experimenting with this new technology, playing around with Linked Data best practices. But as most libraries are closely tight to a vendor they also make their future development more or less dependening on the products that will be offered by this vendor.